Tomorrow, the five members of the UN Security Council plus Germany (known as the P5+1), will sit down with Iran in the latest attempt to ease increasing global anxiety over the country's nuclear programme. The threat of new sanctions hangs in the air. We have been here before: deadline after deadline, sanction after sanction, we return to the same old dance, the only real difference being that the Islamic Republic is inching ever closer to the Bomb. So perhaps now is the time to try something new. In anticipation of the October 1 meeting, the P5+1 must embrace their greatest ally in the war on nuclear proliferation: the people of Iran. Until now, the Islamic Republic has not responded to external pressure from the international community. No amount of sanctions has worked. Instead, President Mahmoud Ahmadinejad soaks up every opportunity to perform on the world stage, entertaining his audience of cool and collected clerics. But those clerics were not so composed on that June day when hundreds of thousands of Iranian people poured on to the streets, demanding an end to fundamentalist tyranny and the regime's oppression of their human rights. In stark contrast to its reaction to international pressure, the regime's response to the internal uprising was immediate. Quivering with fear, it instantly detained more than 4,000 of its own people, suffocating their roaring cries for freedom and democracy. Students and journalists, sons, daughters, mothers and fathers, young and old are still being held, clubbed, raped and tortured by the Islamic clerical regime. Hundreds of others stand falsely accused, helplessly awaiting trial without rights or representation. Human Rights Watch and the International Campaign for Human Rights in Iran urged the UN to appoint a special human rights envoy during last week's meeting of the General Assembly to investigate the Iranian government's egregious record of abuse. And still, suffering under a brutal regime that threatens their very right to life, the Iranian people continue to plead for their liberties, fight for their freedoms and scream for the world's support. The clerics' fearful and nervous response to the people's uprising demonstrated that the biggest threat to their survival in power comes from within their own borders. Contrary to the state-run press and propaganda, the regime's biggest enemy is not the West; it is its own people. By supporting the Iranian people and their struggle for human rights, by elevating the importance of their liberties, the West will find its greatest ally on the nuclear issue. Empowering the opposition movement will encourage and prolong internal dissent, and sustaining that internal unrest is the key to cracking the clerical code. While sanctions can in fact prove to be a useful tool in the shed of diplomacy, they result in the suffering of a nation's citizens, victimising the innocent many for the sins of the stubborn few. For sanctions to truly be effective in Iran, human rights have to be put on equal footing with the nuclear concern. Many of my Iranian compatriots have indicated to me that they would be willing to add to their hardships in the short term only if they believe that sanctions will curtail the lifespan of clerical oppression and cure their want of human rights. In 1986, the United States led a worldwide campaign for human rights and equality in South Africa when it passed the Comprehensive Anti-Apartheid Act, banning US investment in the country. Disinvestment sanctions were about civil rights and human rights, and other world powers quickly followed suit. Most importantly, the removal of apartheid laws and the release of political prisoners were necessary preconditions to the lifting of sanctions. Those sanctions worked. The South African people suffered a deep recession in the short term, but to this day, no South African has forgotten the importance of those preconditions and the long-term liberation they brought to them as a people. In the case of Iran, US foreign policy and international pressure are reaching their limit. External sanctions that are imposed solely to shape Iran's nuclear policy are unlikely to ever decrease the number of centrifuges that enrich uranium. Furthermore, if the issue of enrichment continues to trump the moral fight for the most basic human liberties � namely the right to free and fair elections and the freedom of speech � then the P5+1 will be seen to have abandoned the Iranian people to their plight. Alternatively, if the West enforces new sanctions that are intrinsically tied to the national outcry for freedom, they have armed their greatest ally with the powerful weapon of international solidarity in the struggle against the Islamic regime. This uprising can change the entire fabric of stability in the Middle East. So, while the world toils over yellowcake, the people of Iran still believe in their green movement for freedom, hope and human rights. It is time for international leaders to stand behind the human rights of the Iranian people. In so doing, they will entrust the Iranian people with the power to resolve the nuclear issue. Thank you Prince, very true, very right.... I do wish P5+1 would listen to you. ۲۵۶۸ سال پیش از این، مردی بر تخت شهریاری ایرانزمین برنشست که نام اش می بایست با نام ایرانزمین گره خُورَد. کوروش هخامنشی، در پیرامونی به سیاست ورزی پرداخت، که تیره های ایرانی در پراکندگی به سر می بردند و در فراسوی مرزهای ایرانزمین نیز، خشم و کین و بی قانونی و تاریک اندیشی فرمان می راندند. او اما، با همبسته کردن همه ی ایرانیان زیر یک پرچم واحد و گرد یک فرهنگ سیاسی و اجتماعی مشترک، که بر بردباری پایه ای، خرد ورزی اصولی، کردار نیک و دلیری هوشمندانه استوار بود، کاخ با شکوهی را پایه گذاشت که با وجود همه ی گزندهای پنداشتنی، تا به امروز نیز فرونریخته است: تمدن ایرانی. پرسش این است: کوروش، که ایرانیان به حق او را پدر می نامند و امروز از زن و مرد و پیر و جوان آرامگاه اش را گلباران می کنند و بزرگ اش می دارند، آیا یک تافته ی جدا بافته بود و یا خیر، برایندی بود از فرهنگ خردمدار و انسان دوستانه ای که در اش پرورش یافته بود؟ من فکر می کنم پاسخ برای همه ی ما روشن باشد. کوروش، با همه ی یکتایی شخصیتی اش، از آن رو کوروش شد، چرا که فرهنگ و جامعه ای که در آن روئیده بود چنین امکانی را به او می داد. پس امروز این بر یکایک ماست که برای بازیابی و بازسازی آنچه که نیای بزرگوار مان، کوروش، برای ما بر جا گذاشت، به وارسی و پژوهش آن فرهنگ پر فروغی بپردازیم که انسان هایی چون کوروش و همانند او را از زهدان خود زائیده بود. چرا که نمی توان کوروش را بزرگ داشت، اما برای فرهنگی که او از آن برامده بود، ارجی به جا نیاورد. من، به عنوان یک آزادیخواه، با آگاهی کامل به نقش و مسئولیت تاریخی ام، روز کوروش بزرگ را به یکایک شما هم میهنان عزیزم شادباش می گویم. جنبش آزادیخواهانه ی مردم ایران، که برایندی از یک خودآگاهی ژرف تمدنی و تعهد به سنت درخشان فرهنگ و هنر و سیاست ایرانی ست، با نام کوروش هخامنشی گـره خورده است. با به یاد آوردن انــدیشه و گفتار و کـِردار کوروش بـزرگ، هـر ایرانی می داند که �آزادگی�، طبیعت سلب ناشدنی او، و �آزادی�، حق مسلم اوست. نسل جوان امروز ایران بهترین گواه برای اثبات این حقیقت انکار ناپذیر است که کوروش، در یکایک فرزندان اش، بیدار و هشیار است. پدر عزيزم ميدونم اين به هيچ عنوان تبريک تولد گوئي خوش آيندي نبود، اما بي تو دنيامون خاکستري شده و روزگارمون سياه، اما تولدت مبارک، مبارک جاي جاي قدمهایت بر خاک ايران، مبارک باد غرور و غيرتي که براي ما بجا گذاشتي، مبارک باد نامي که براي ايران بجا گذاشتي، مبارک باد نامت، مبارک باد يادت مبارک باد مبارک باد مبارک باد. يکي اينکه با تک تک ذرات وجودم پسرت رو تنها نميگذارم و چه به نتيجه برسيم و چه نرسيم تا آخرين لحظه زندگيم به شاهزاده برومندت رضا پهلوي خدمت خواهم کرد. نه تنها من که بدان بسياري ايرانيان بيدار و ايران دوست هنوز هستند که با من همراه باشند. دوم اينکه سال آينده حتما در رکاب شهبانو در همين ايام در قاهره بر مزارت بوسه خواهم زد. it because it is my duty," he says. the figurehead for the three or four million strong Iranian diaspora. convinced him of the importance of avoiding it in Iran. public debate. There is an absence of the ballot box." Green Movement, he can monitor events at home almost as they happen. themselves from the regime," he tells me. opposition they are showing to Ahmadinejad. isn't it time, after 30 years, that you opened up a dialogue with us? only representative of God on Earth, I interpret the laws'." made violent by the Revolutionary Guard - as enormously significant. than endless rounds of failing diplomacy." e is far from sure that the West, notably America, is taking notice. because they can no longer contain their differences". sitting in Tel Aviv right now, this is a matter of life and death". dilly-dallying. Soon it will be too late." that would harm the people. and applying restrictions on their foreign travel by refusing visas." at stake on the development of a nuclear weapon. are doing nothing about it." people to be part of the solution". they have children of their own, and they are disillusioned. regime: but the solution has to be based on amnesty and reconciliation. piece of real estate I call home. That is my duty." to be part of it, you tell me. If you don't, so be it." warned against any armed intervention. former Soviet Union -- all of it came at the hands of the people of those nations themselves,"
Reza Pahlavi told the Daily Telegraph. revolution, and has lived in the United States since 1984.
nuclear weapons, something Tehran denies. especially, much more so than endless rounds of failing diplomacy," Pahlavi said. language skills, it is obviously meant for the outside world," he said. If this support is not forthcoming, "we may as well run up the white flag on the nuclear threat. Copyright � 2009 AFP. All rights reserved. "زماني كه فكر ميكنم ما ايرانيان توسط اين افراد جنگ طلب حامي تروريست ها و منكرين هالوكوست بدنيا شناسانده ميشويم آيا امكان دارد كه اينجا بنشينم و هيچ نگويم؟؟؟من در مقابل كارهايم توقعي ندارم ولي مبارزه ميكنم چون اين وظيفه منست." "پايان رژيم جدائي طلب در افريقاي جنوبي نظاميان "يونتاس" در امريكاي جنوبي و بالا ترين آنها شوروي كمونيست فقط با دست مردم آن كشورها انجام گرفت اما هيچكدام آنها بدون پشتيباني از خارج امكان پذير نبود ولي اين بمنزله يك قواي اشغالگر نبود كه بيايد و رژيمي را عوض كند و من هيچ مشروعيتي در اينكار نميبينم." " امروز در خيابانهاي ايران مردم فرياد ميزنند "اوباما اوباما يا با اونها يا با ما"
اين پيام مردم است به دنياي خارج. ما به اوباما و ديگر رهبران دنيا ميگوئيم كه بكمك شما نياز داريم." " اگر مايليد كه ديالوگي با رژيم ما داشته باشيد اين بخودتان مربوط است ولي آيا زمان آن نرسيده است كه پس از سي سال با ما هم گفتگو كنيد؟؟جنبش سبز ميگويد ما ميخواهيم از اين رژيم خارج شويم .آنها به راي اكثريت تعهد دارند و مردمي هستند كه ميگويند ما بايد به عقيده هر كسي احترام بگذاريم و از آن دفاع كنيم." "اينان جوانان امروز ايران هستند بسيار متفاوت از آناني كه سي سال پيش يك رهبر بزرگ با ايده ئو لوژي بزرگ را خواهان بودند.اينان مردمي هستند كه حقوق بشر را بصورت خشت اول همه خواسته هايشان ميبينند مردمي كه خواهان سيستمي بر مبناي عدالت هستند و نه كسي كه بگويد : بعنوان تنها نماينده خداوند روي زمين قانون آنست كه من ميگويم." "اگر آنها (مردم ايران)شعارهائي بزبان انگليسي در خيابانهاي تهران با خود حمل ميكنند به منظور نشان دادن توانائيشان در زبان انگليسي نيست و كاملا مشهود است كه براي رساندن پيامشان به دنياي خارج است.غرب هم بايد ببيند كه سقف رژيم در همه پايگاه هايش ترك برداشته و متوجه شود كه اين وضع دوام آور نيست.نميتوان با باتوم بر سر مردم كوبيد و اميد وار به آرامش بود." "مهره هاي اصلي حكومت در تهران همگي ميدانند كه مشروعيت رژيم زير سئوال است. متعصبين مذهبي در باره روشي كه مذاكرات هسته اي به پيش ميرود خشمگينند ولي اين موضوعات همگي از پرده بيرونند چون آنان ديگر نميتوانند اختلافاتشان را پنهان نگاهدارند." و اين مسئله براي تلآويو مسئله مرگ و زندگيست." فعلا در حال بازي قايم موشك هستيد ولي بزودي خيلي دير خواهد شد." "امروز در ايران پلاكاردهائي كه مردم حمل ميكنند ميگويند "مرگ بر روسيه و مرگ بر چين". سفارت امريكا ديگر لانه جاسوسي نيست و مردم شعار ميدهند "سفارت روسيه لانه جاسوسيه".روسها براي اولين بار از زمان پطر كبير تا بامروز در ايران با دسترسي به آبهاي گرم جا خوش كرده اند و اين رژيم شديدا وابسته به پشتيباني روسهاست و بهمين دليلست كه آنها در مقابل امريكا و اروپا و به پشتيباني از رژيم اسلامي ميايستند. بدون اين پشتيباني رژيم هيچ ندارد و خود و طرفدارانش هم اين را بخوبي ميدانند." " حتي اگر سازمان ملل نتواند با تحريمات موافقت كند ما هنوز گزينه تحريم هاي دسته جمعي رادر اختيار داريم.باضافه توافق هائي كه ميتواند بين امريكا و متحدان اروپائيش انجام بگيرد. ما نياز به تحريم هاي هوشمندانه اي داريم كه رژيم و دستگاه حكومتي را تضعيف كند. ولي من از هيچكاري كه به مردم صدمه بزند پشتيباني نميكنم." "بعنوان مثال ميتوان دارائي ها و سرمايه هاي سران رژيم را در خارج هدف قرارداد. همچنين سرمايه هاي سپاه پاسداران و تشديد محدوديت ها براي سران رژيم و سپاه در مسافرت هاي خارجي بصورت ندادن ويزاي ورود به كشور." "آنها با رژيم فاشيست در آلمان نازي جنگيدند با رژيم نژاد پرست در افريقاي جنوبي مقابله كردند همچنين با حكوميت توتاليتردر بلوك شرق . و ما امروز در ايران رژيمي داريم كه مخلوطي از هر سه آنهاست و هيچكس كاري در مقابل آن انجام نميدهد." "من از زمان جنگ ايران و عراق با اعضاي سپاه پاسداران تماس داشتم و دارم .من ميدانم كه آنها ميدانند كه وضعيت ديگر قابل ادامه نيست . اين سپاهيان همسالان من هستند .آنها در زمان جنگ جواناني كم سال بودند كه كلاشينكف بدست در جبه ها ميدويدند ولي امروز آنها در سنين بالاي چهل و پنجاه هستند و داراي خانواده و فرزند و دچار سردرگمي." " آنها ميگويند اين آنچيزي كه ما بخاطرش جنگيديم نيست و ميتوانيد تصور كنيد كه خيلي هاشان مايل به كناره گيري هستند ولي همزمان نگران زندگي خود و خانواده شان پس از تغيير رژيمند. راه حل اين مشكل بايد بر مبناي بخشودگي عمومي و باز نگري كلي اجتماعي باشد . مجازات اعدام بايد حذف شود و نتطه پايان بر دايره خشونتها گذارده شود." شاهزاده رضا پهلوي توصيه رونالد ريگان به آقاي قرباچف در بيست سال پيش را باز گو ميكند كه گفت "آقاي قورباچف اين ديوار را خراب كنيد"
" من دوران كودكيم را بياد دارم .من تمام مناظر كشورم را از بچگي بخاطر دارم و هر كجاي دنيا كه باشم بياد انها هستم .من كشورم را تنفس ميكنم و با آن زندگي ميكنم وميخواهم براي آن سرزميني كه وطن ميخوانمش كاري انجام بدهم و اين وضيفه منست." "من هرگز به فكر اينكه چه رلي در آينده داشته باشم نبوده ام ولي امروز فقط يك ماموريت ويژه دارم . من داوطلب شده ام هم ميهنانم را تا جائي رهبري كنم كه بتوانند آزادانه به پاي صندوق هاي راي بروند و خودشان در باره نوع حكومتشان تصميم بگيرند .آنروز براي من پايان خط است.پس از آنروز اگر ميخواهيد كه من هم نقشي داشته باشم بمن بگوئيد و اگر هم مرا نخواستيد همان خواهد شد." ایران به وجود جوانانی چون شما می بالد، در وجود جوانانی چون شما می ماند، و با وجود جوانانی چون شما، می شکفد و پی در پی تازه می شود. عزیزانم، شما با نمایش دل انگیز خود در برافراشته نگهداشتن پرچم آزادگی و آزادی خواهی نشان دادید، که نه تنها امروز نوک پیکان دانایی ایرانی هستید، بلکه با تکیه به نبوغ فرهنگی و تمدنی خود، بی باکی و بزرگ دلی را نیز به خِرد دوستی و مِهر به راستی پیوند زده اید. شما، که مایۀ فخر ایران و مشعل داران راستین سنت شکوهمند جندی شاپور هستید، همانند نیاکان نیک اندیش تان هم دانش دارید و هم بینش، هم خِرد دارید و هم عشق، و به راستی که آمیزش این چهار گوهر ناب، چیزی جز هنر زرین ایرانی بودن نیست، هنری، که شما فرزندان بزرگمهر و برزویه به زیباترین و والامنشانه ترین وجه نمایندگی اش می کنید. Security Forces (Police, Pasdaran and Military) leadership must act in the direction of freeing all political prisoners, regime change, replacing it with Free society and Secular Democracy. The Iranian people have already spoken clearly.. The Armed Forces must choose between defending and serving the people of Iran or serving the Mullahs and Islamist Taazi. This is up to Armed and Security Forces to choose between SHAME and HONOR, serving Mullahs or their Sisters, Brothers, Fathers & Mothers who pay their salaries. Iranian people of all ages do not have any choice other than being prepared to fight to free their Motherland from the viruses of Iranian society in past 1400 years whether or not the Armed Forces serve them or serve the enemy of freedom and free society. Iranian people should be prepared for a final battle using any means for freeing their Motherland from TAAZIS and must not forget that their inspirational leader Cyrus the Great died in battlefield in 530 BC at the age of 60 and not in bed. Those security forces in Iran who do not respect the rights of students and people to protest and they torture Iranian people have no place to hide any where �. The purpose of submitting this protestation letter, is not to hint about the internal as well as external activities which brought about the present cr imi nal & brutal Islamic Republic in Iran (IRI), which in the last 30 years on top of enslaving & massacre of Iranian people, has caused sedition all over the world . Also the aim of this protestation is not to indicate the part that UK government played to put in power the IRI, as the majority of the Iranian people believe. Today we took the opportunity to write to your Excellency this protestation to question the behavior of some of the mass media establishment in UK & their anti-Iranian policy, who do not hesitate to use contemptuous language towards Iran & our national leaders & heritage! - - The observation of respect & curtsey is an ethical prerogative of the interviewer towards the guest speaker, which in the above said interview by Mr. Fany of BBC Persian program, the opposite was used ! - To intentionally drag the conversation to by lanes by asking questions irrelevant to the subject of discussion & the program, ignoring the current disturbances in Iran is contrary to the ethics of journalism & impartiality on the part of the interviewer to stress his own point of view ! - Disrespecting the national sentiments after thirty years of enslavement, torture, massacre and suffocation of populace who are struggling for freedom, is the least that our nation expects from the free world including UK, the cradle of democracy ! By disgracing the National leader & his struggle to bring about democracy in our beloved land is far from fairness & diplomacy. - -We are certain that during the 57 years of the illustrious reign of the Pahlavi Dynasty our country was speedily running towards democratic society, with obvious tangible reasons & results to this clime, if even the interviewer of BBC had a different view , to interrogate any person for the mistakes committed by others is illegal & contrary to the juries prudence. There are other points of controversy but to be brief we will not adhere to them at this juncture. - In regards to Iran is your antagonism towards the system of Monarchy, or the Mohammad Reza Shah Pahlavi? - If you are against Monarchy in general, then how come that you support it in your own land? - But if UK had difficulty with Mohammad Reza Shah Pahlavi who is dead & gone since thirty years ago, today in Iran the over whelming majority yearn & pray for his sole, you refrain to acknowledge the cry of our people, who bravely struggle with their own blood to bring back the glory of his time? - Our aim is not to bring back Mohammad Reza Shah�s era, but to revive our glorious ancient culture & history of respect & care for mankind. It is unethical if the interviewer is against system of Monarchy to impose accusations to another person just to prove his own point of view. It is also amazing that such a person who lives in UK & has a job with a semi governmental office to clearly demonstrate HIS anti Monarchy feelings? - If the Principle of Monarchy System is in question, then it is relevant to remember that during the ages there were some despot kings ruling UK . Is the existence of those despots, questions the validity of the Monarchy System in UK today? - If the Monarchy System is in question, then how is it that in Spain after the semi republic, the system of Monarchy was over whelming adopted by the Spanish people, is accepted? Or even in UK after the republic of Olivier Cromwell restoration of Monarchy System did not raise any objection by the populace? - How is it that you, all knowing, have the right to decide the fate of other far off nations? - Is it due to the fact that safe guarding your economic interest is well served by IRI, universally known inhuman cr imi nal regime rather than re-establishment of Monarchy system in Iran ? - Is it not the time that you emphatically help the Iranian nation to archive Human rights, which you so vehemently advocate and at the same time, put aside your hidden policy of exploitation of others and actively respect their independence? - At last but not least, the most important question is: How is it that the BBC personal can stretch them further than their journalistic ethical & l imi tation of the subject & stick to the question at hand & stop biting around the bush and forgoing the integrity of the person who is interviewed with the intention to confuse him & the issue? Since Reza Shah the Second has never declared that his aim & intention is to re-establish the system of Monarchy in Iran, and on the contrary, HE has always emphasized that HIS aim is just to bring about freedom & democracy for Iran and leave the system of head of the State to the choice of people, therefore asking such irrelevant question from HIM was either the ignorance of the BBC personnel or outright negligence plus insult ! At the end we emphasize our protest concerning the way the BBC Persian program personnel handled the interview with disrespect towards the sentiment of the entire Iranian people. And we deem it proper that BBC is obliged to amend their mistake and apologies for their miss behavior towards Reza Shah the Second first & the entire Iranian people. Reza Shah the second acts above the petty wrangling of politicians. HE is the symbol of our unity & we deem it our duty to safe guard HIS integrity not only with BBC but with any other mass media who deviates from the journalistic ethical code of conduct . We expect your Excellency�s reaction & response to this protestation letter. 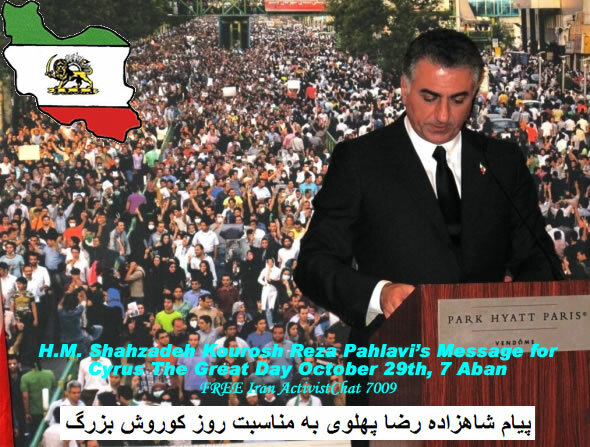 9/25/2009 Prince Cyrus Reza Pahlavi, answering questions in front of the UN.